The Gunpowder is flowing at 164 CFS, is 41 degrees and clear. A glimpse of winter weather late tonight in the form of sleet, snow and ice will likely make it tough going on the trails till tomorrow around mid-morning. With cold weather just starting in late January, anglers have plenty of winter fly fishing on the way. With black flies, midges and stoneflies commonly hatching from January through late February we are close to fishing dries again. 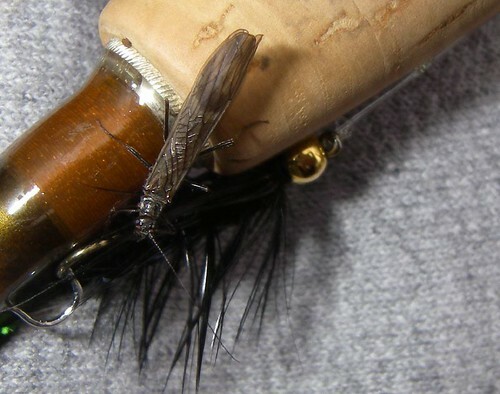 Nymphing with small, heavy stonefly patterns in very shallow stretches of the river has been most effective in the catch and release area. A good strategy that will keep one warm on cold, blustery days is to hike the trails with a slightly heavier rod fitted with a short sink-tip line and a trace of 4x flourocarbon and a conehead bugger. Watch your step and fish the riffles and log jams outside of the catch and release area. These waters are typically a little warmer, (up to 5 degrees) than the waters immediately downstream of the Dam when it is spilling over. This entry was posted in fishing report on January 20, 2012 by Theaux Le Gardeur.